Today's Sunrise Serenade was "Our Love Was Meant To Be" by Count Basie and His Orchestra. Click on the song title to listen courtesy of Jazz On Line. The playlist for the August 30, 2017 broadcast of the Swing Shift Shuffle has now been added to the playlist filing cabinet. 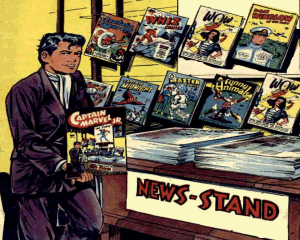 A post on Boing Boing alerted me to the existence of Comic Book Plus, a free online archive of thousands of public domain comic books, comic strips, pulp fiction and other similar publications from the Golden and Silver Age, as well as some old time radio, vintage movies and TV. Although I have not had the opportunity for any significant exploration of the site, the few pages I have seen make me want to see more. Today's Sunrise Serenade was "Nice Work If You Can Get It" by Billie Holiday. Enjoy the video from YouTube. Sunrise Serenade: Is You Is Or Is You Ain't My Baby? Today's Sunrise Serenade was "Is You Is Or Is You Ain't My Baby?" by Bing Crosby and the Andrews Sisters. Click on the song title to listen courtesy of Jazz On Line. According to Vintage Everyday, the above film shows hot rods at a southern California race track in the 1940's. I'm going to hazard a guess that this footage was from the late 1940's, since fuel, oil and rubber would have been severely rationed during World War II. I like how several of the cars get into drifts apparently just to avoid the camera vehicle. This morning's Sunrise Serenade was "Little Toot" by the Andrews Sisters from the 1948 Disney film Melody Time. Enjoy the video from DailyMotion. This morning's Sunrise Serenade was "All Over Nothing At All" by Ella Fitzgerald. Click on the song title to listen courtesy of Jazz On Line. The playlist for the August 23, 2017 broadcast of the Swing Shift Shuffle has now been added to the playlist filing cabinet. This morning's Sunrise Serenade was "Did You Mean It?" by Benny Goodman and His Orchestra with Ella Fitzgerald on vocals. Enjoy the video from YouTube. Today's Sunrise Serenade was "Body And Soul" by the Benny Goodman Trio. Click on the song title to listen courtesy of Jazz On Line. Today's Sunrise Serenade was "I Don't Want To Set The World On Fire" by the Ink Spots. Click on the song title to listen courtesy of Jazz On Line. The playlist for the August 16, 2017 broadcast of the Swing Shift Shuffle has now been added to the playlist filing cabinet. The Red Hot Lindy Hop lessons and sessions continue at the Rumba Room with live music this Friday night by Jeremy Shrader's Hot Memphis Six. Free beginner lesson at 7:00 p.m. Admission is $5 before 7:00 p.m. and $7 thereafter. This morning's Sunrise Serenade was "No Restricted Signs (Up In Heaven)" by the Golden Gate Quartet. Enjoy the video from YouTube. Today's Sunrise Serenade was "Cuckoo In The Clock" by Johnny Mercer. Enjoy the video from YouTube. This Warner Bros. short was released in 1941, but since cartoons took a long time to produce at that time, the studio could have easily started the process in 1940. The gags about the poor equipment used to train U.S. troops has a definite origin in truth. In the mid- to late 1930's, the Army was so underequipped that it did use wooden machine guns and ordinary cars carrying signs that read "tank." From YouTube, here is Rookie Review. Memphis magazine recently did an interesting article about George Francis Barnes Jr., the son of a well-to-do Memphis insurance agent, who eventually became Public Enemy Number One: "Machine Gun" Kelly. Captured in his home town of Memphis in 1933, it seems his wife, Kathryn Thorne, an attractive brunette with a quick wit and friendly smile, was the key to his reputation. Today's Sunrise Serenade was "Along The Santa Fe Trail" by Glenn Miller and His Orchestra with Ray Eberle on vocals. Click on the song title to listen courtesy of Jazz On Line. This item, posted on Four Color Shadows, is not one of those biographical comics about a celebrity as I have sometimes posted before. In this story from 1949, a Hollywood columnist with a movie star girlfriend encounters the inimitable Groucho Marx in everything but name, and madcap antics ensue. I say "in everything but name" because the character could not be anyone other than Groucho, and no name is ever given for the mustached, cigar-smoking, wise-cracking, woman-chasing little guy. I came across this fun little Disney cartoon on YouTube the other day, and I have enjoyed it several times since. It shows a story that has repeated itself time and again since the birth of the automobile, but in this case, with the help of what some have called America's "first recyclers" (i.e. hot rodders), this tale has a happy ending. Enjoy Susie The Little Blue Coupe. While there are some traditional crowd-pleasers like Cary Grant, John Wayne, Marilyn Monroe, and Elizabeth Taylor, there are also quite a few stars who haven’t been featured in a while. I’m particularly looking forward to Gene Kelly, James Cagney, Lon Chaney, Franchot Tone, Angela Lansbury, Rosalind Russell, and Ann Harding days. Today's Sunrise Serenade was "Mean To Me" by Teddy Wilson and His Orchestra with Billie Holiday on vocals. Click on the song title to listen courtesy of Jazz On Line. The playlist for the August 2, 2017 broadcast of the Swing Shift Shuffle has now been added to the playlist filing cabinet.